VARIETY OF: Beryl , Be3Al2Si6O18 . USES: Gemstone and as a source of beryllium. Goshenite is a variety name applied to transparent, colorless beryl - the "mother of gemstones". White beryl would simply be called beryl. Other gemstone color varieties that belong to beryl include emerald (green beryl), heliodor (yellow beryl), morganite (pink beryl), and aquamarine (blue beryl). Other colors of beryl are simply referred to by their color, such as golden beryl and red beryl. Since all these color varieties are caused by impurities and pure beryl is colorless, it might be tempting to assume that goshenite is the purest variety of beryl. However, there are several elements that can act as inhibitors to color in beryl and so this assumption may not always be true. The name goshenite has been said to be on its way to extinction and yet it is still commonly used in the gemstone markets. 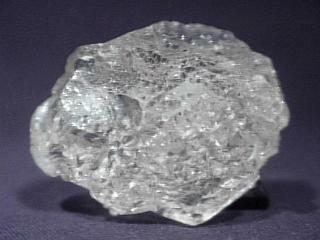 Goshenite is found to some extent in almost all beryl localities.